It’s another month of the Silhouette Creator’s Challenge. I was sad I missed last month, but I was so busy trying to get my office and craft room remodel done (with a trip to Hawaii snuck in there too), that I had to skip it. 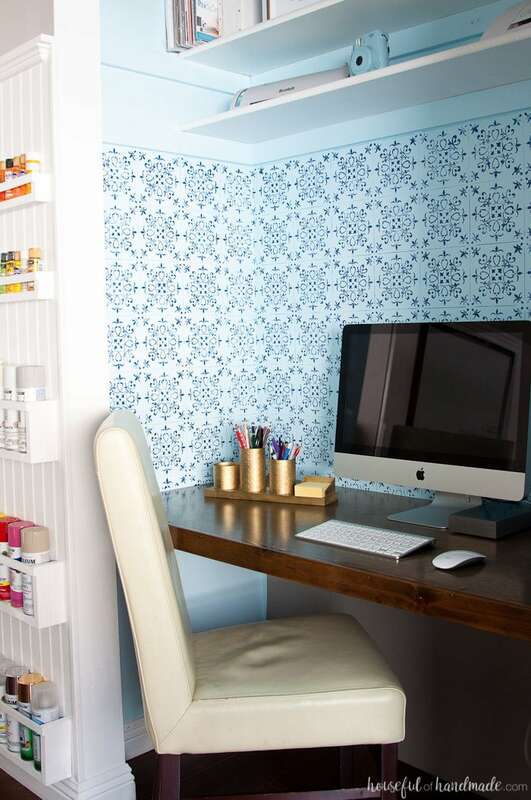 However, when Cat from Pocket of Posies told me that this month’s challenge was “Stencil It”, I knew it was the perfect opportunity to share the patterned tile wall stencil DIY I did in my new office space. In case you didn’t get a chance to see the office & craft room remodel, you can check out the reveal here (and Week 1, Week 2, Week 3, and Week 4 updates too). The entire room was remodeled on a budget of only $100! That’s insane I know, but it made me really think twice about where to spend my money and get creative with lots of DIYs. I built my desk in one of the closets, but it needed a little something more. This is not my first homemade wall stencil. I made one at the end of last year for my son’s room. It turned out so amazing! You can see the first layer here, but sadly I haven’t shared the second layer that makes it look really awesome (I will put that on to-do list and promise to share soon). Since I already had a few extra thin plastic sheets lying around, I decided to use them to make a DIY wall stencil for my desk area too. The hardest part was deciding what design I wanted for my new office space. Since I have been all heart eyes for the beautiful patterned tiles I’ve been seeing in lots of home remodels lately, I decided to make a faux patterned tile area with my wall stencil. It also gives my desk area a little bit of girly sophistication. My office area is the perfect place to add a little bit of the girly decor I love. 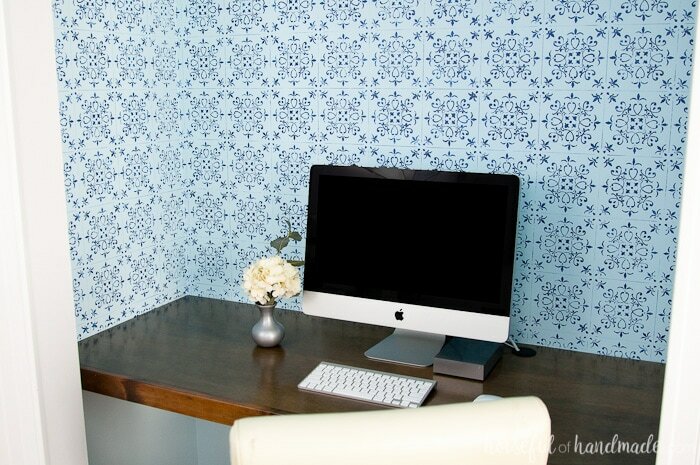 I designed the patterned tile wall stencil DIY with lots of flourishes and fleur-de-lis so it looks like a hand painted patterned tiles. Then I painted the stencil with a loose hand so they weren’t perfect, it added even more to the hand painted look. This was the perfect way to get the high-end look I love within my budget. 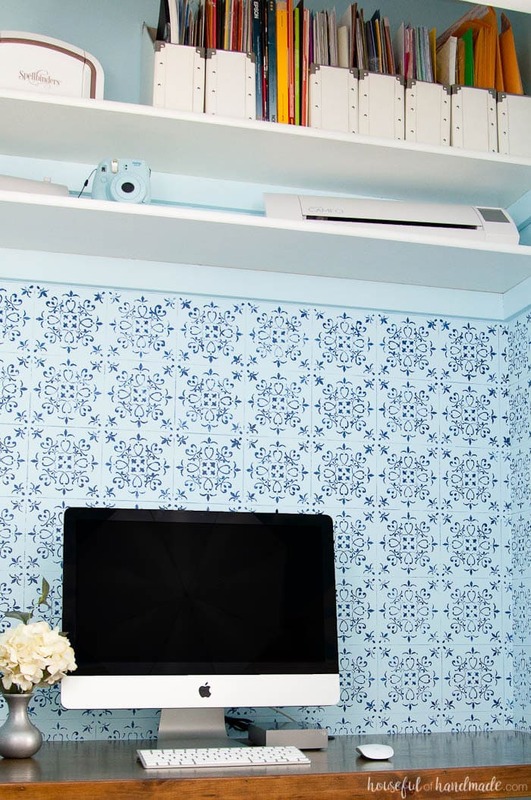 If you want to stencil your own room, click the arrow below for all the details of how to stencil a wall, as well as the Silhouette cut file for the patterned tile wall stencil I used. 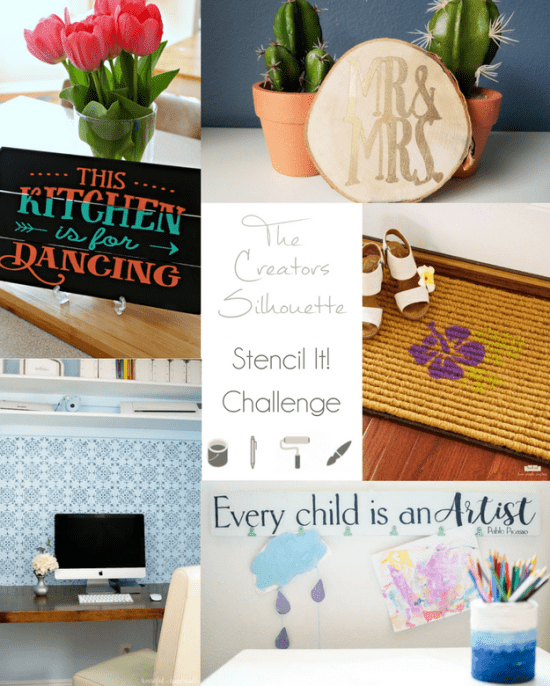 And don’t forget to check out these other amazing Stencil projects you can make with your Silhouette. I can’t wait to stencil lots more! Ok, I can barely function with the stencils I get, let alone diy one! Well done, this looks awesome! Thanks Erica! It adds so much design. I love it! This is amazing!!! 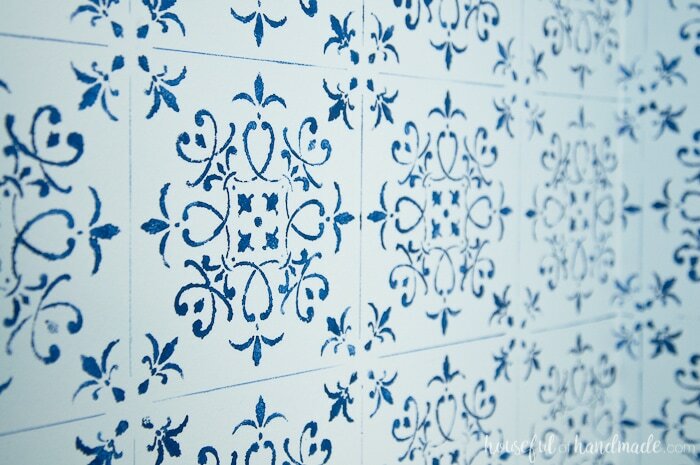 It truly looks like hand-painted tile – I never would’ve known the difference! Thanks so much Emily! I love how it turned out.